Laughing and joking, a group of 5K runners warmup before the start of the race. Queen's Park Savannah, Port of Spain. 28th January, 2017. 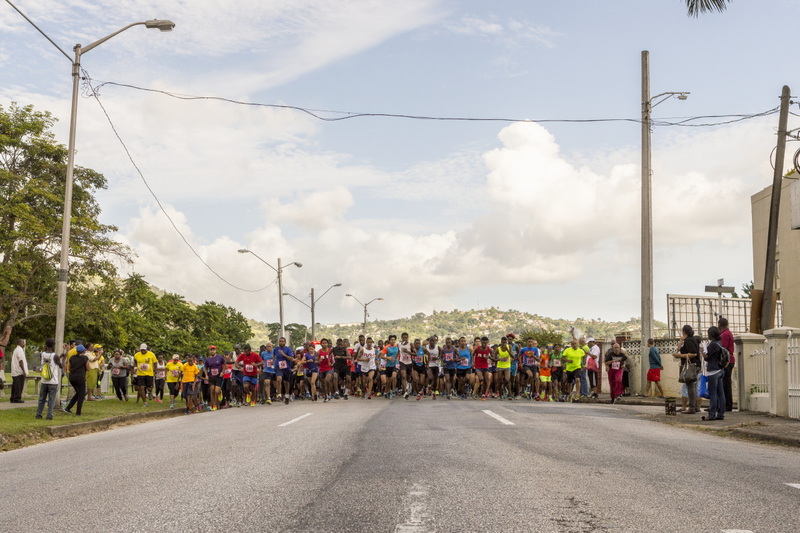 The 2017 Trinidad and Tobago International 5K startline. Queen's Park Savannah, Port of Spain. 28th January, 2017. 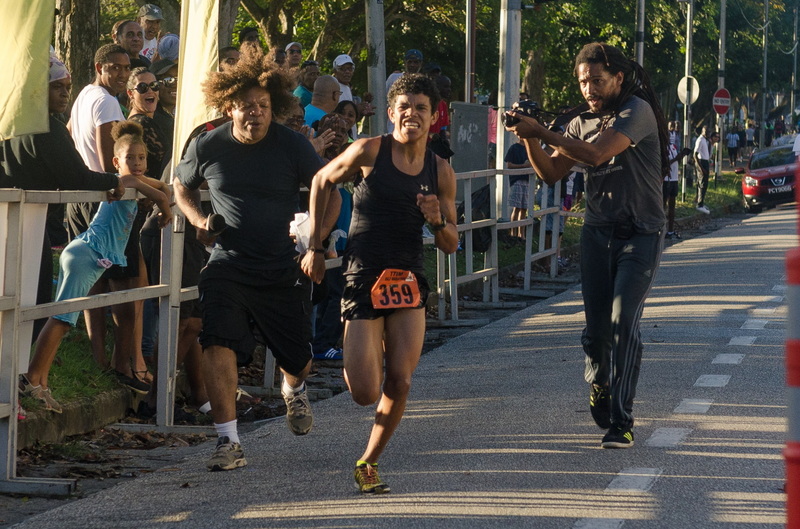 Start of the 2017 Trinidad and Tobago International 5K. 28th January, 2017. 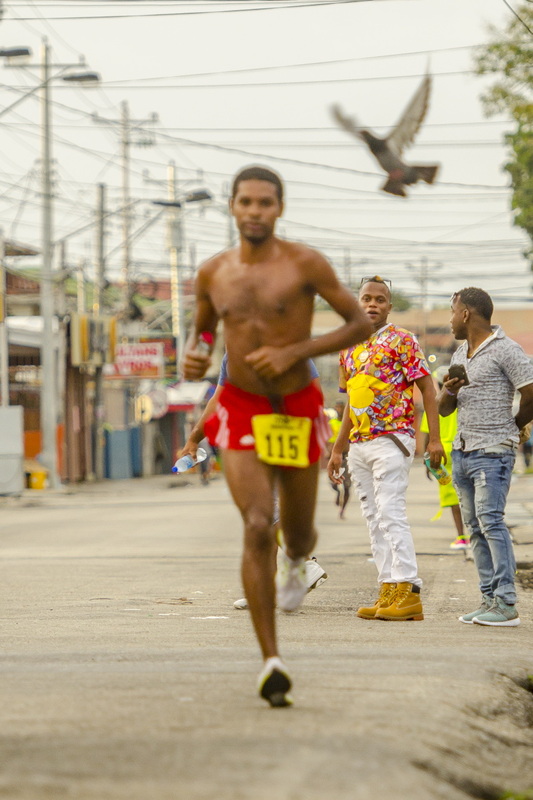 Karl Maraj, sixty-nine, runs through the warm sunshine at the 2017 Trinidad and Tobago International 5K, held at the Queen's Park Savannah, Port of Spain. 28th January, 2017. An athlete. Justin Garcia at the 2017 Trinidad and Tobago International 5K, Queen's Park Savannah—28th January, 2017. 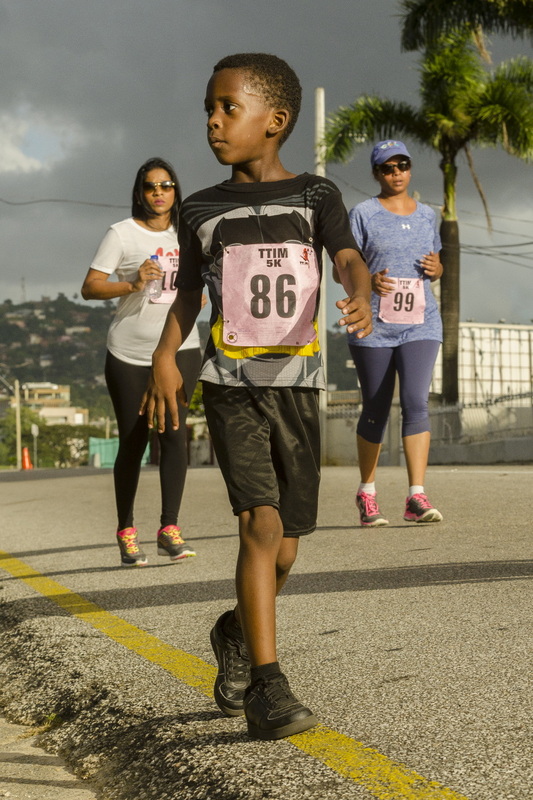 Twelve-year-old, Divaio Ramsamooj, participates in the 2017 Trinidad and Tobago International 5K. 28th January, 2017. 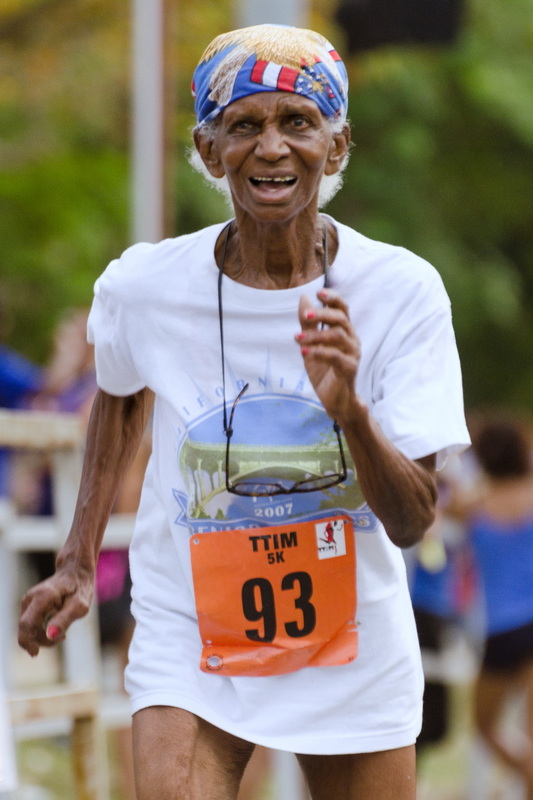 Rookmin Budhu finishes off the 2017 Trinidad and Tobago International 5K, organised by the Trinidad and Tobago Marathon Committee, held at the Queen's Park Savannah, Port of Spain. 28th January, 2017. 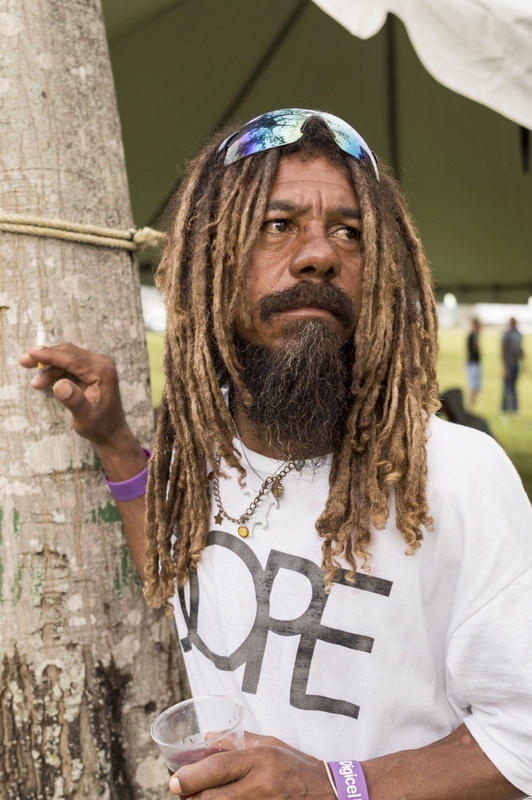 Saying that he is an illegitimate son of Bob Marley, a man steadies himself on a tree after asking the photographer to make his portrait. Queen's Park Savannah, Port of Spain. 28th January, 2017. 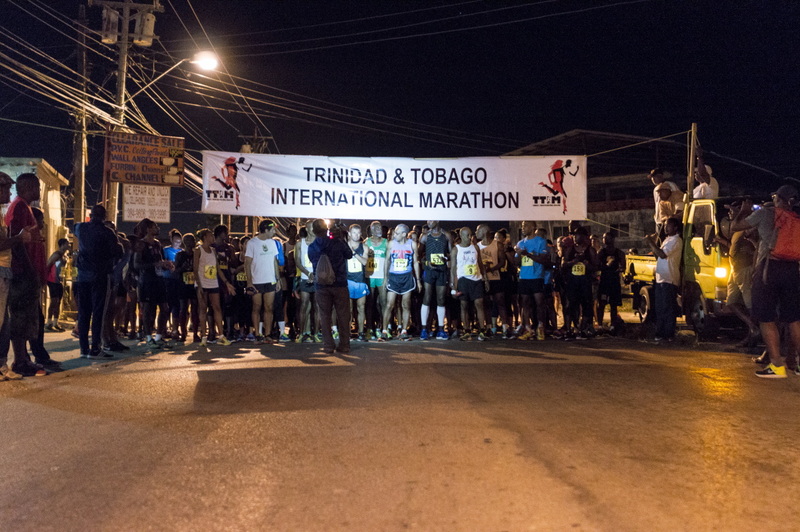 The 2017 Trinidad and Tobago International Marathon, organised by the Trinidad and Tobago Marathon Committee. 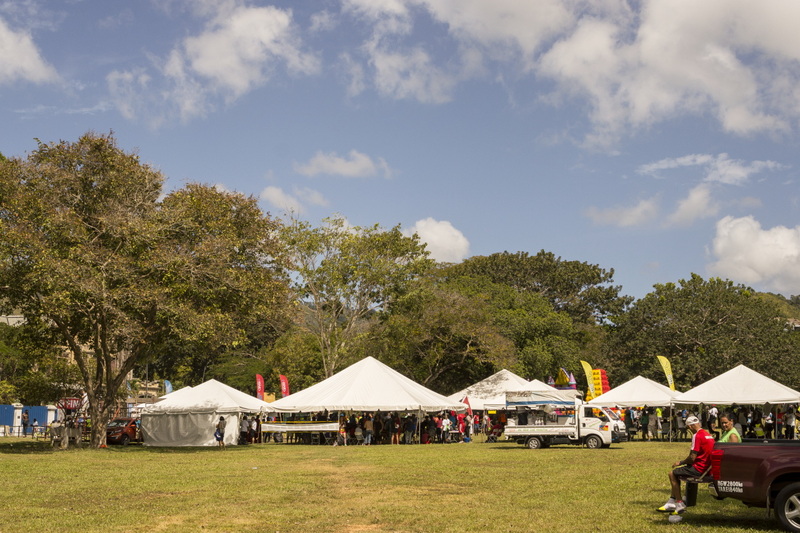 The event began at before sunrise at Saint Mary's Junction, Freeport, finishing at the Queen's Park Savannah, Port of Spain. 29th January, 2017. 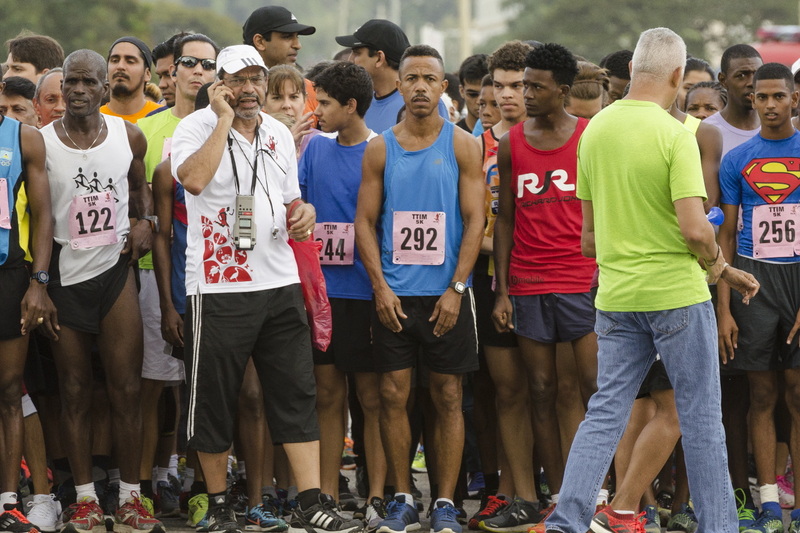 Scene from the startline of the 2017 Trinidad and Tobago International Marathon. 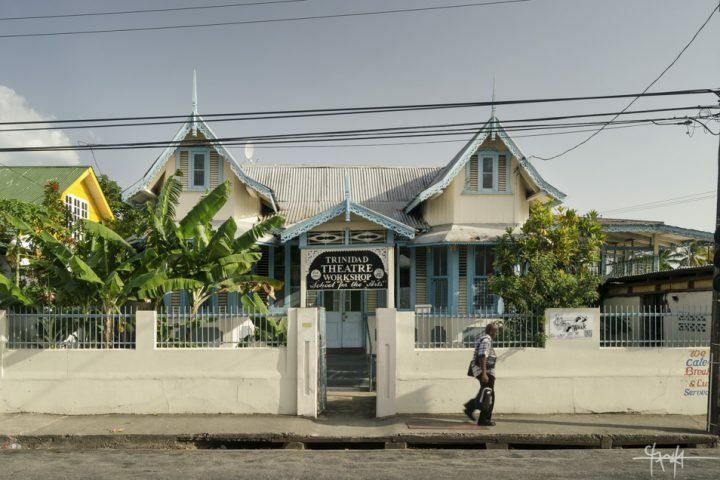 The course began at Saint Mary's Junction, Freeport, and finished at the Queen's Park Savannah, Port of Spain. 29th January, 2017. 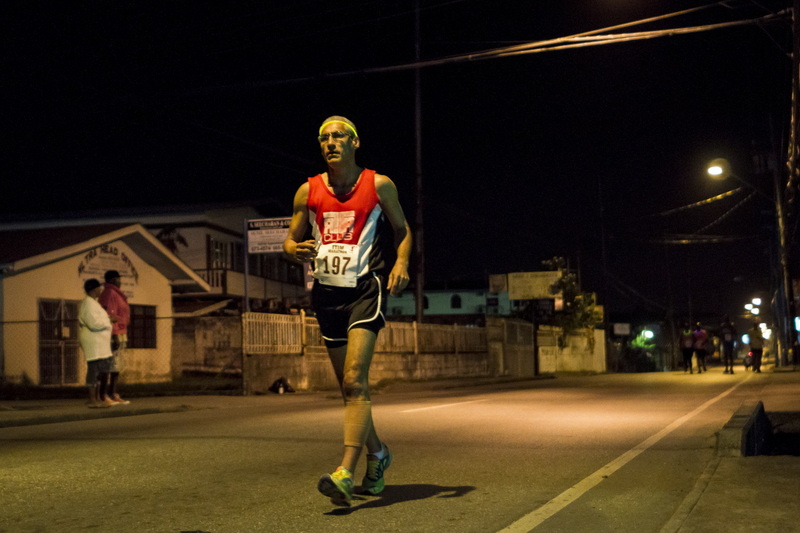 Marathon early-starter, Victorio Hawkins, walks through the darkness of Southern Main Road. 29th January, 2017. 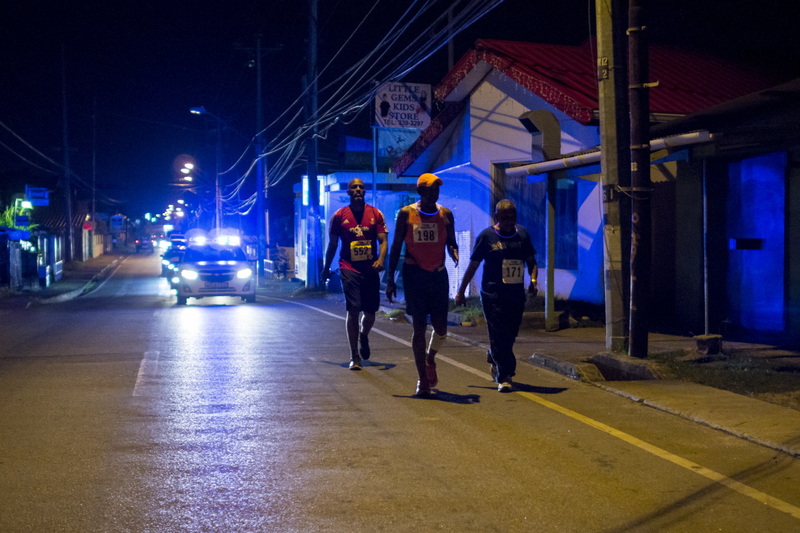 Backlit by policecar lights, a trio of marathon participants walk through the darkness of Southern Main Road. The course began at Saint Mary's Junction, Freeport, and finished at the Queen's Park Savannah, Port of Spain. 29th January, 2017. So to write an article on behalf of Runners' World Magazine, international marathoner, Sofia Hedström, mingles with other runners at the early-morning start of the 2017 Trinidad and Tobago International Marathon. The course began at Saint Mary's Junction, Freeport, and finished at the Queen's Park Savannah, Port of Spain. 29th January, 2017. 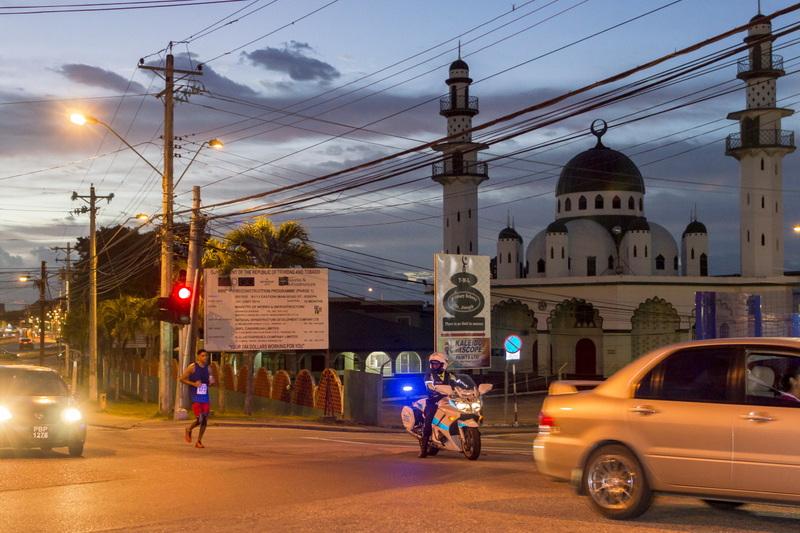 Running in first place among the early-starters, marathoner, Kishan Roopchand runs past the Saint Joseph Trinidad Muslim League Masjid on Eastern Main Road, Saint Joseph. 29th January, 2017. Passersby on an early Curepe morning get lost looking on at marathoners running Southern Main Road. 29th January, 2017. 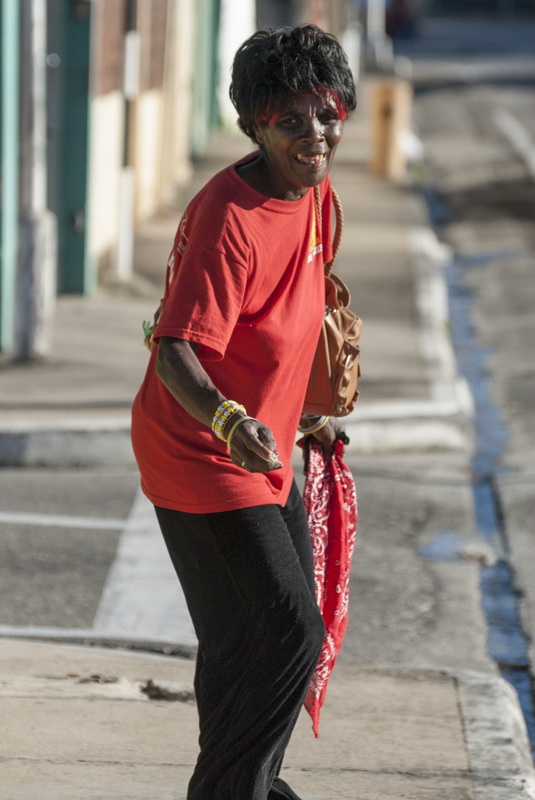 As day breaks, marathoners on Southern Main Road, Curepe, run past doubles vendors on their way to Curepe Junction. 29th January, 2017. 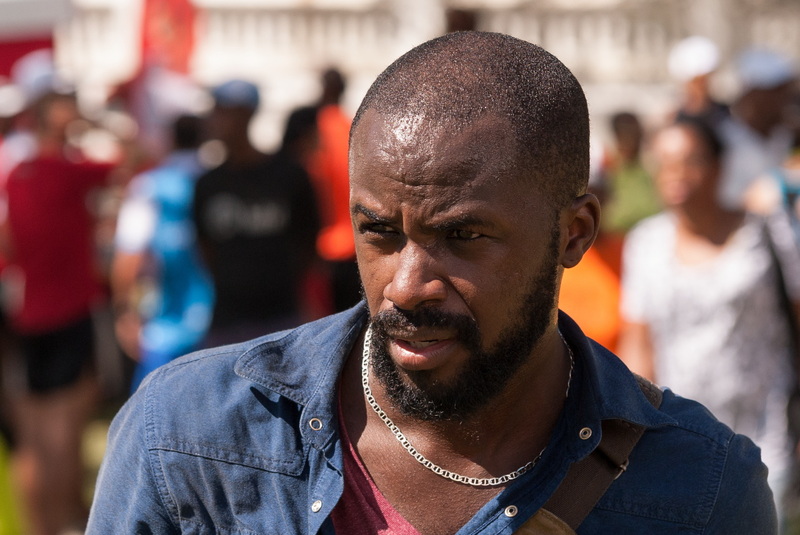 Winsbert Sylvester enters Port of Spain, running along South Quay, as he follows the 2017 Trinidad and Tobago International Marathon route. 29th January, 2017. 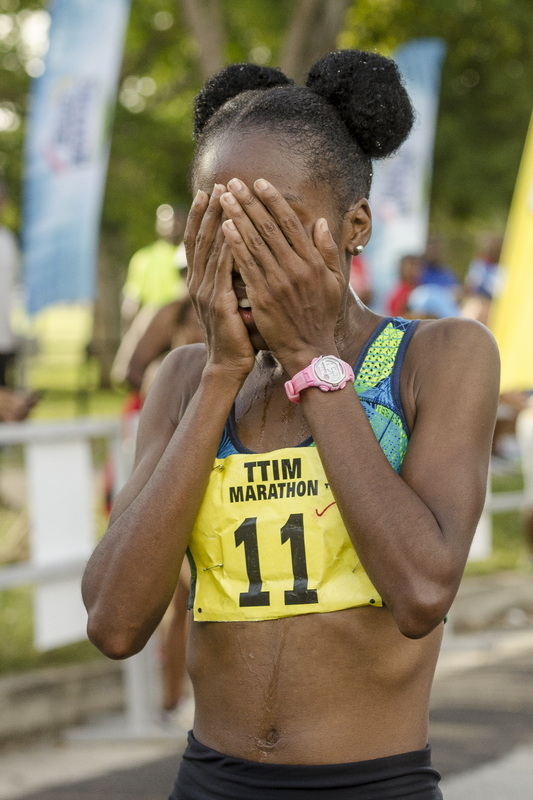 Leah Kigen of Kenya completes the 2017 Trinidad and Tobago International Marathon, victoriously, claiming first place (female) with a time of two hours, fifty-four minutes. 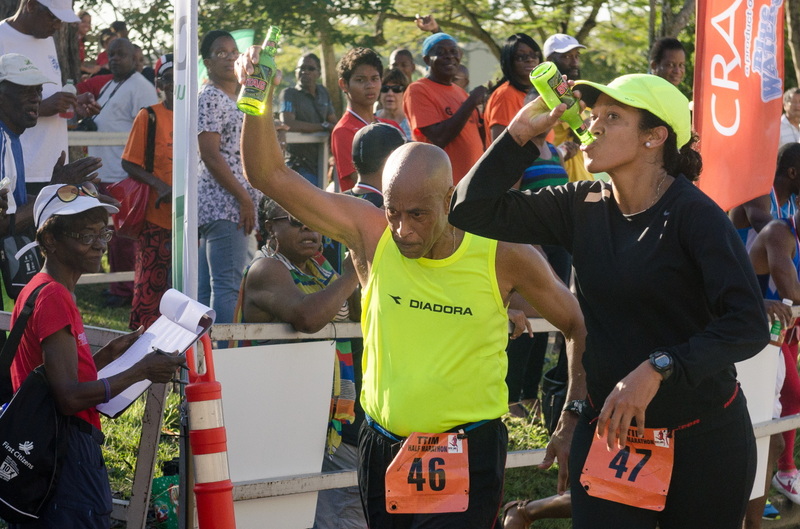 Forty-two kilometres long, the course began at Saint Mary's Junction, Freeport, and finished at the Queen's Park Savannah, Port of Spain. 29th January, 2017. 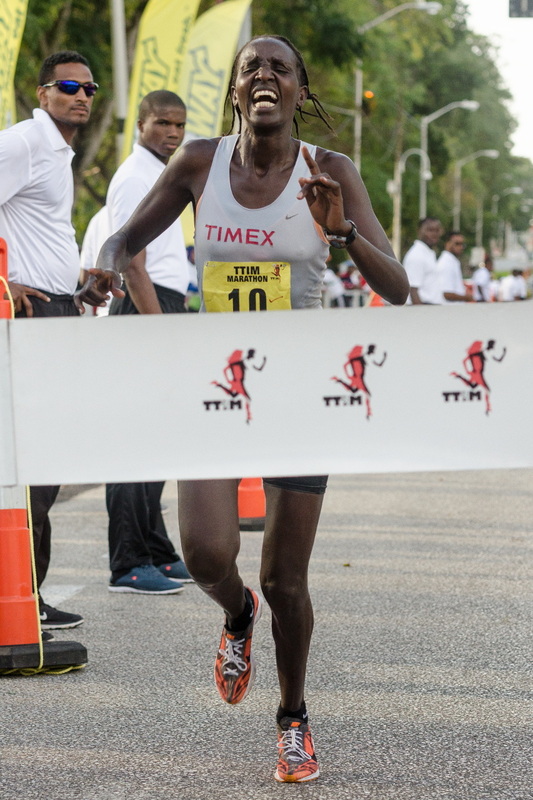 In two hours, fifty-six minutes, Tonya Nero of Saint Joseph, Trinidad finishes her 2017 TT International Marathon run in second place (female), only two minutes shy of Leah Kigen of Kenya. 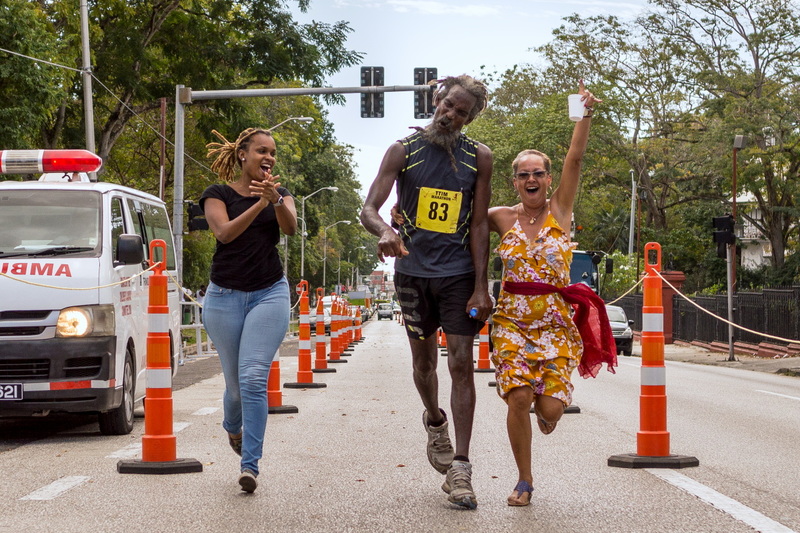 Forty-two kilometres long, the course began at Saint Mary's Junction, Freeport, and finished at the Queen's Park Savannah, Port of Spain. 29th January, 2017. 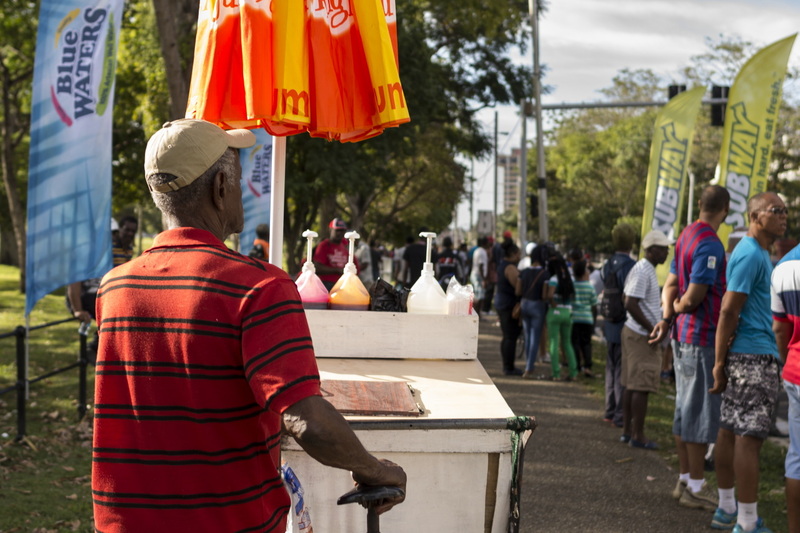 A snowcone vendor exerts his trade to spectators and tired athletes alike at the 2017 Trinidad and Tobago International Marathon. Queen's Park Savannah, Port of Spain. 29th January, 2017. 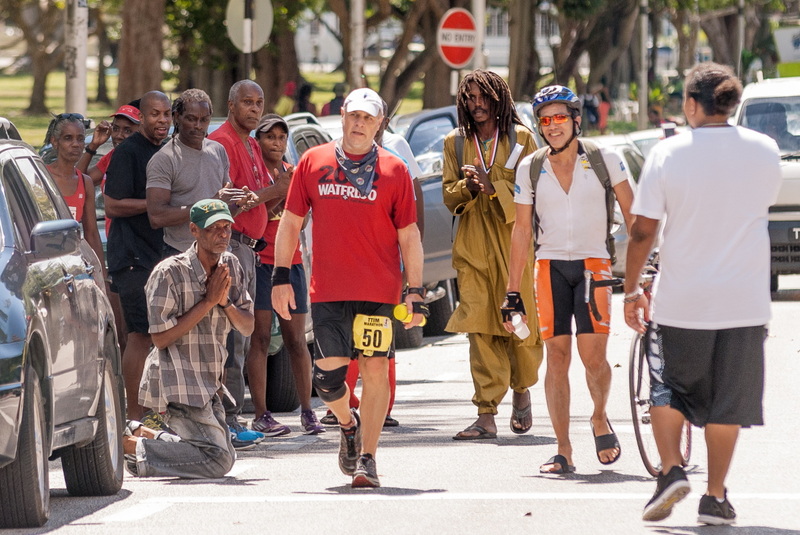 Multisport athlete, Ancil 'The Greene Machine' Greene, runs the final stretch of the 2017 Trinidad and Tobago International Marathon course, passing by the Archbishop's Residence. 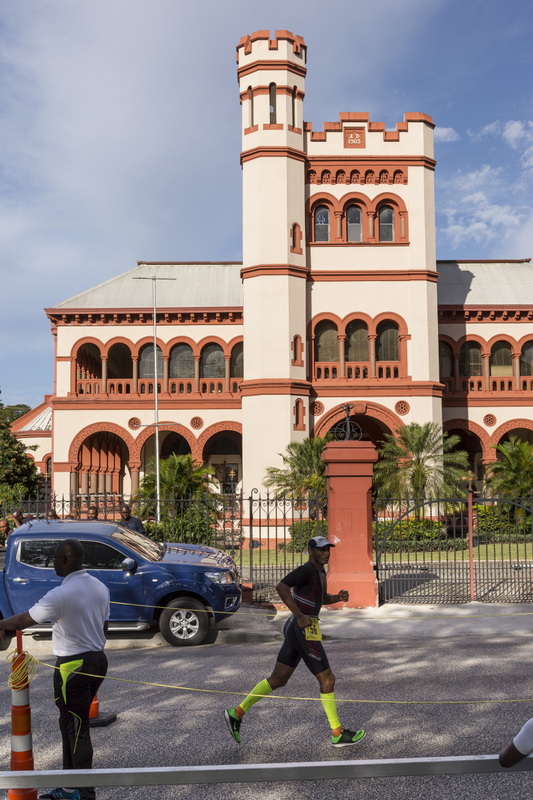 The building was constructed in 1903 for Archbishop Patrick Vincent Flood, and is considered to be one of Trinidad and Tobago's 'Magnificent Seven'. Queen's Park Savannah, Port of Spain. 29th January, 2017. 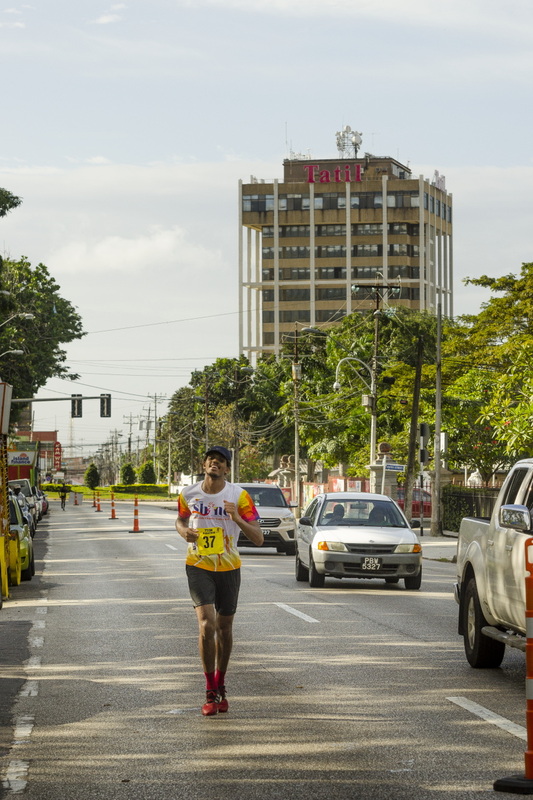 Korey Gill runs up the final stretch of the TT International Marathon course with Maraval Road and the iconic Tatil building in the distance. 29th January, 2017. 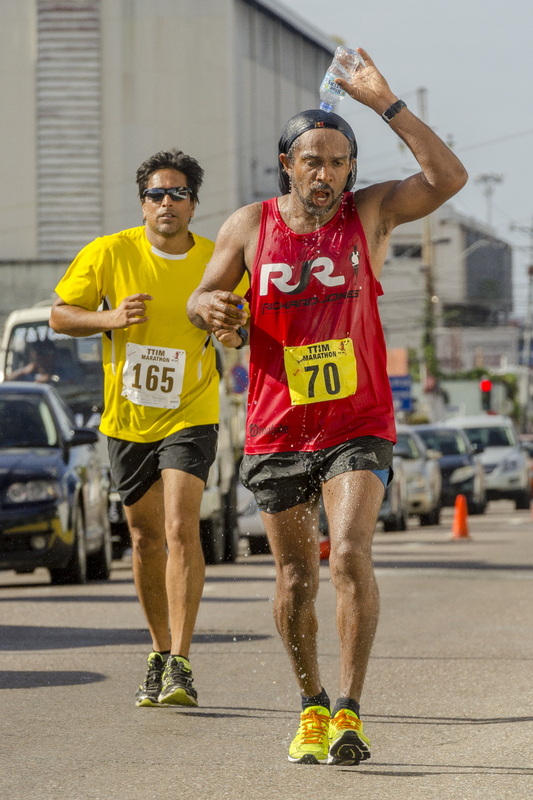 Marathoner, Jason John douses himself with water as he runs through the intense heat on Colville Street, Port of Spain. Rawle Ragoonanan, and early-starter, comes up behind. 29th January, 2017. 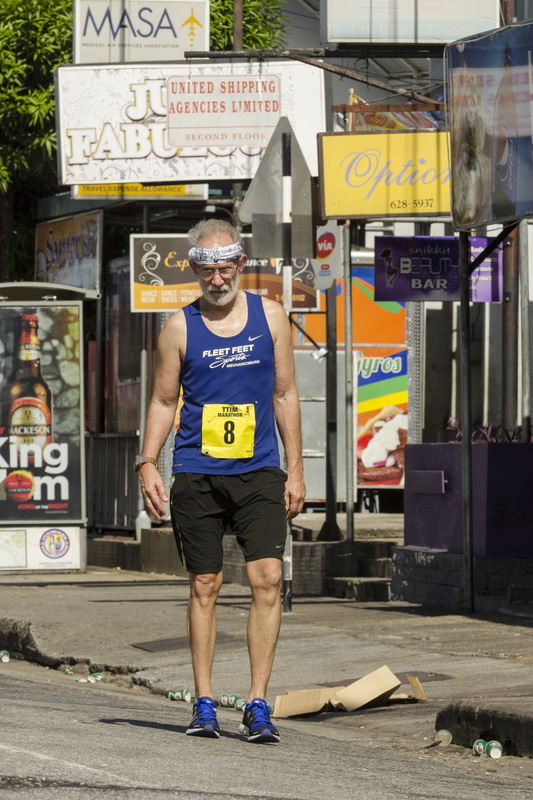 The hot, near-midday sun drops onto a tired marathoner at the 2017 Trinidad and Tobago International Marathon. The course began at Saint Mary's Junction, Freeport, and finished at the Queen's Park Savannah, Port of Spain. 29th January, 2017. 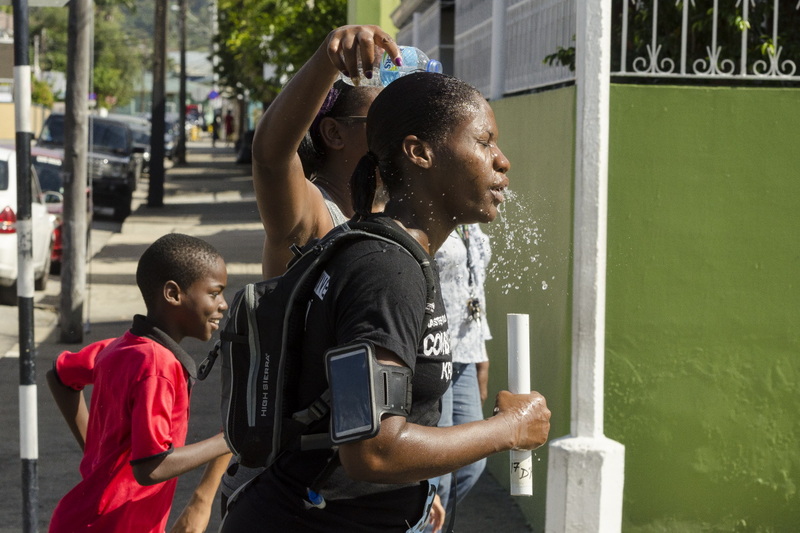 As the blazing, near-midday heat falls upon a marathon relay competitor, water is poured onto her head by a supporter. The course began at Saint Mary's Junction, Freeport, and finished at the Queen's Park Savannah, Port of Spain. 29th January, 2017. Susannah Joefield defiantly makes her way up Cipriani Boulevard to the Queen's Park Savannah finish of the 2017 TT International Marathon. 29th January, 2017. 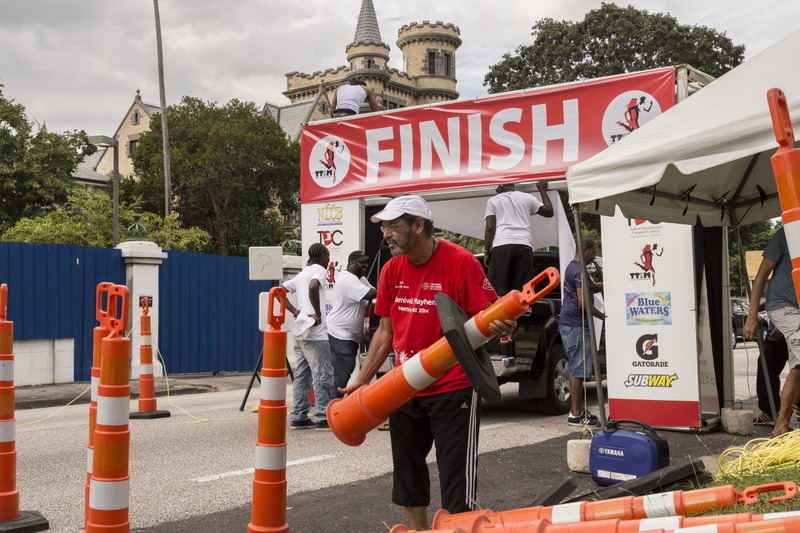 The 'Marathon Village' of the 2017 Trinidad and Tobago International Marathon, organised by the Trinidad and Tobago Marathon Committee. The course began at Saint Mary's Junction, Freeport, and finished at the Queen's Park Savannah, Port of Spain. 29th January, 2017. 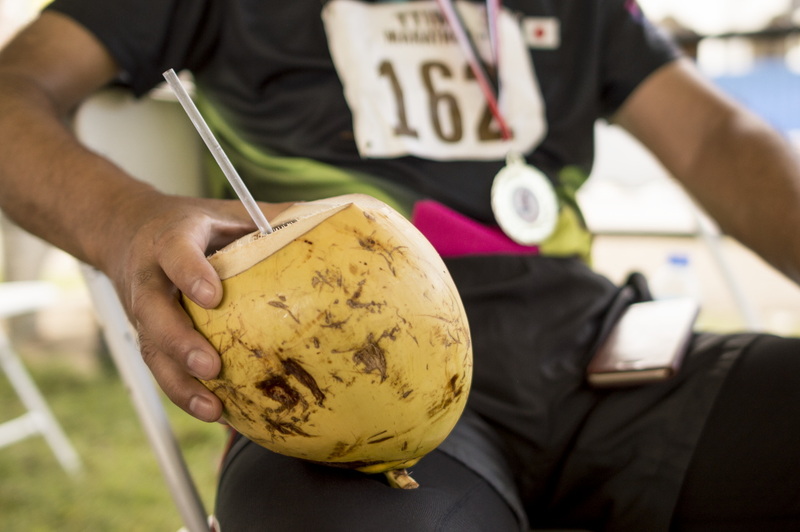 The hand of seventy-year-old marathoner, Toshinori Watanabe of Hachioji, Japan, holding a Trinidadian coconut as he rests and recovers from his seven-hour walk, forty-two kilometres from Saint Mary's Junction, Freeport to Queen's Park Savannah, Port of Spain. 29th January, 2017. 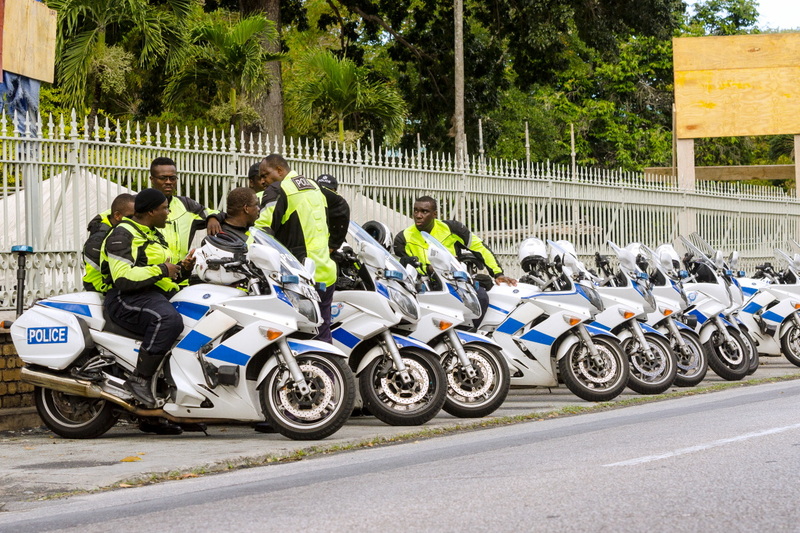 A row of TT Police Service motorcycles, driven by officers who aided the logistics, safety, and security of the 2017 Trinidad and Tobago International Marathon course. 29th January, 2017. 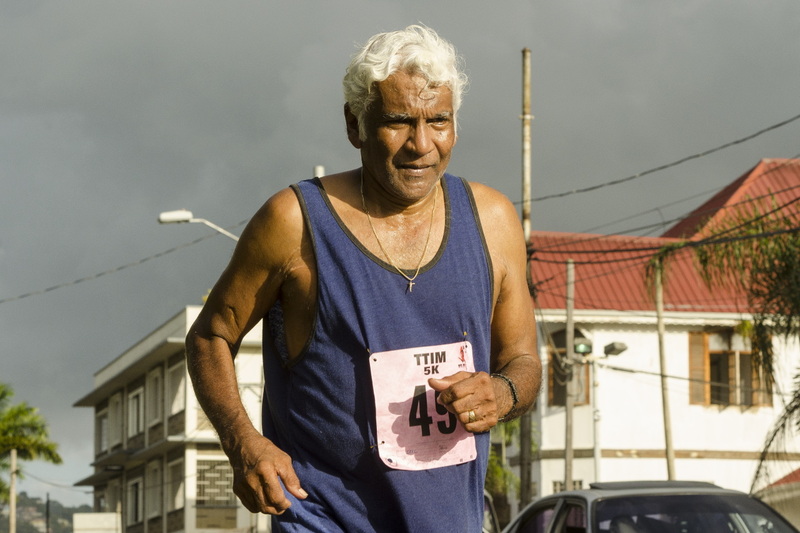 After over seven hours on the road, sixty-year-old Ezra Bethel closes off the 2017 Trinidad and Tobago International Marathon. The course began at Saint Mary's Junction, Freeport, and finished at the Queen's Park Savannah, Port of Spain. 29th January, 2017. 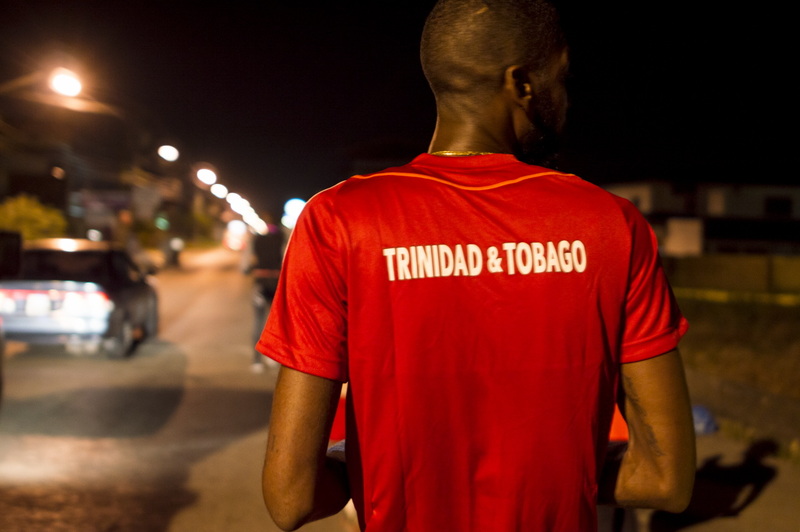 Trinidad and Tobago International Marathon early-starters stretch their legs and warm up before beginning the journey from Saint Mary's Junction, Freeport, to the Queen's Park Savannah, Port of Spain. January 17th, 2016. 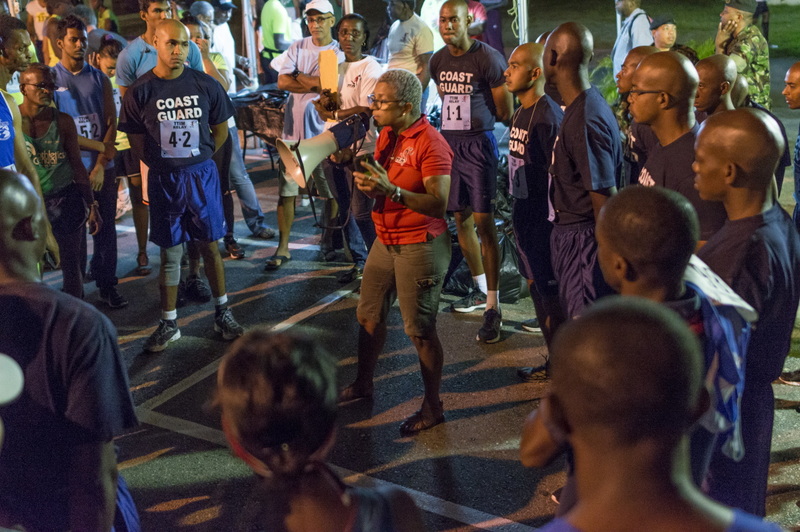 Trinidad and Tobago Marathon Committee President, Diane Henderson, briefs marathon participants on the morning of the thirty-fourth Trinidad and Tobago International Marathon. January 17th, 2016. 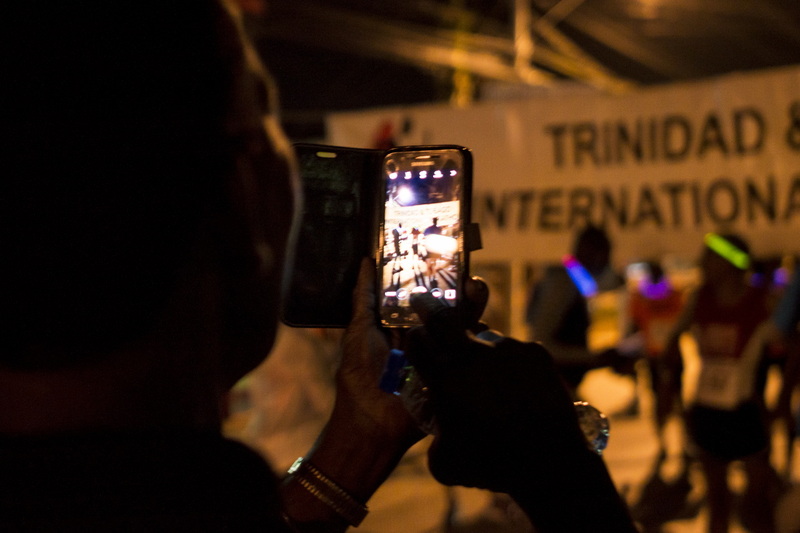 The thirty-fourth Trinidad and Tobago International Marathon, which was run a distance of forty-two kilometres; from Saint Mary's Junction, Freeport, to the Queen's Park Savannah, Port of Spain. January 17th, 2016. 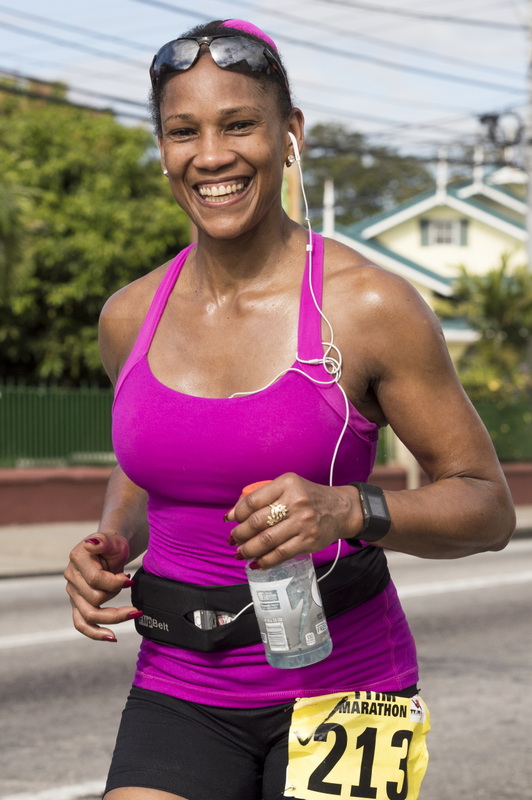 US marathoner, Arlene Nichols Saffian, runs along Ariapita Avenue as part of the thirty-fourth Trinidad and Tobago International Marathon. January 17th, 2016. 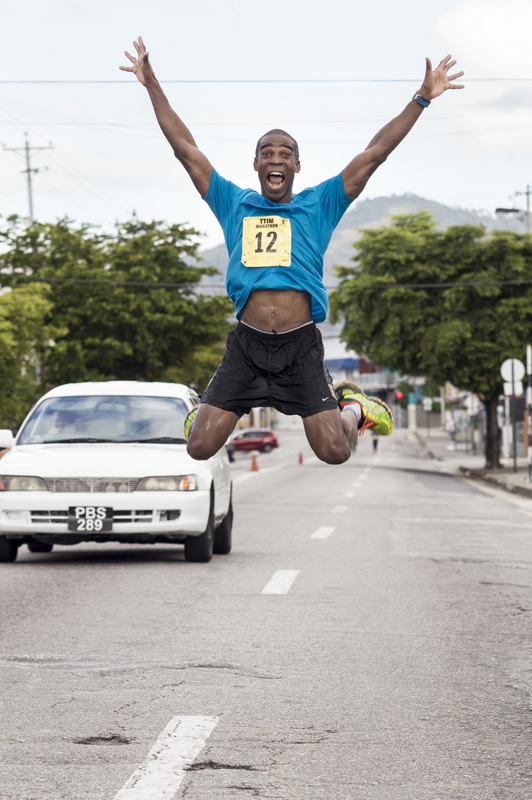 An energetic marathoner launches himself into the air above Ariapita Avenue mid-race. 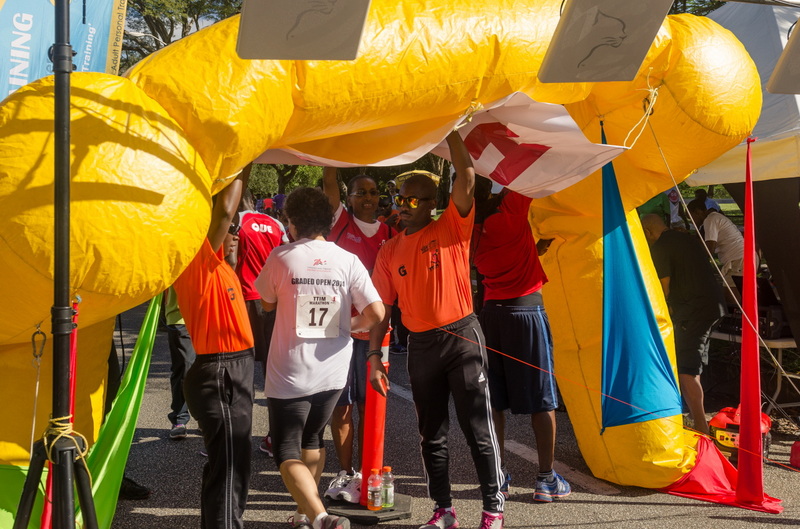 The event was run a distance of forty-two kilometres; from Saint Mary's Junction, Freeport, to the Queen's Park Savannah, Port of Spain. January 17th, 2016. A tired TT International Marathon early-starter rests himself on the bed of a pickup at the Queen's Park Savannah, Port of Spain. January 17th, 2016. 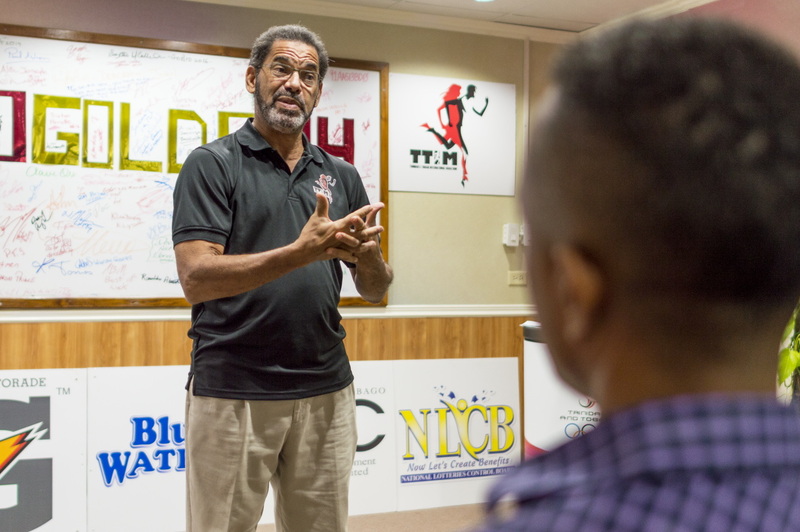 TT Marathon Committee Race Director, Francis William-Smith, speaks at an award presentation for the Trinidad and Tobago International 5K. January 22nd, 2016. 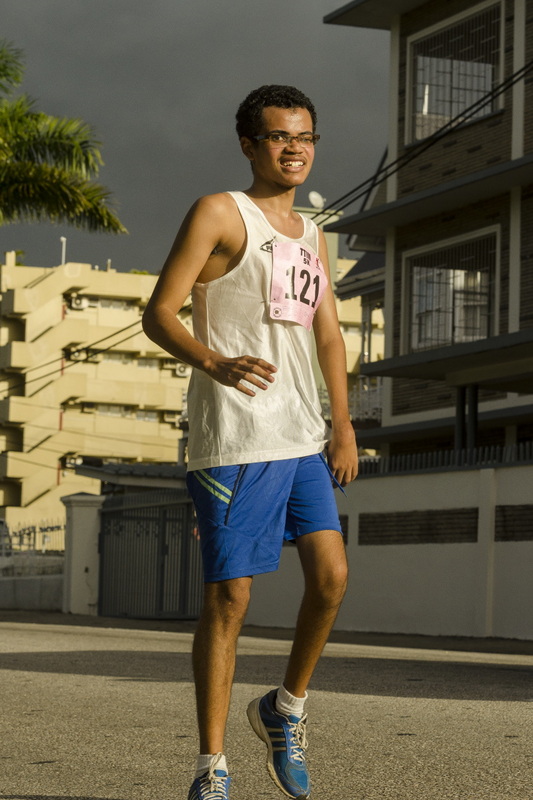 Joshua Ho grits his teeth as he finishes the the 2015 Trinidad and Tobago International Half Marathon, which was run from Frederick Settlement, Caroni to the Queen's Park Savannah. January 25th, 2015. 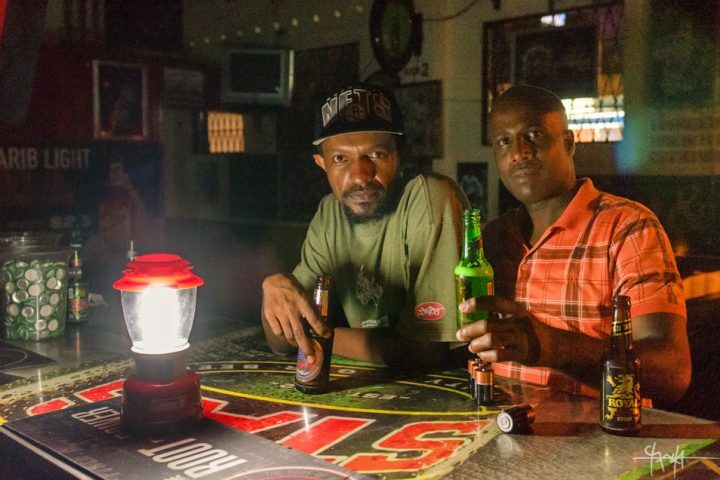 A pair of athletes polish off some beers as they cross the 2015 Trinidad and Tobago International Marathon's finishline. January 25th, 2015. Marathon finishline volunteers double-check their log of finishing athletes. 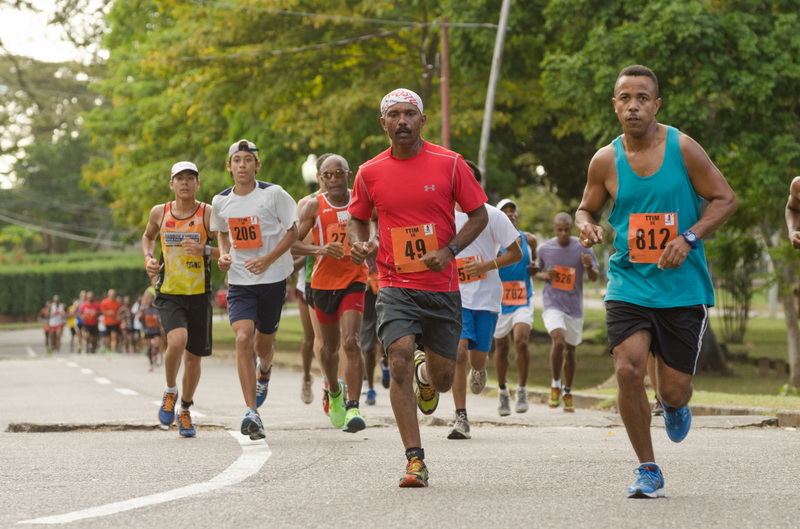 Scene from the 2015 Trinidad and Tobago International Marathon, which was run from Saint Mary's Junction, Freeport to the Queen's Park Savannah. January 25th, 2015. 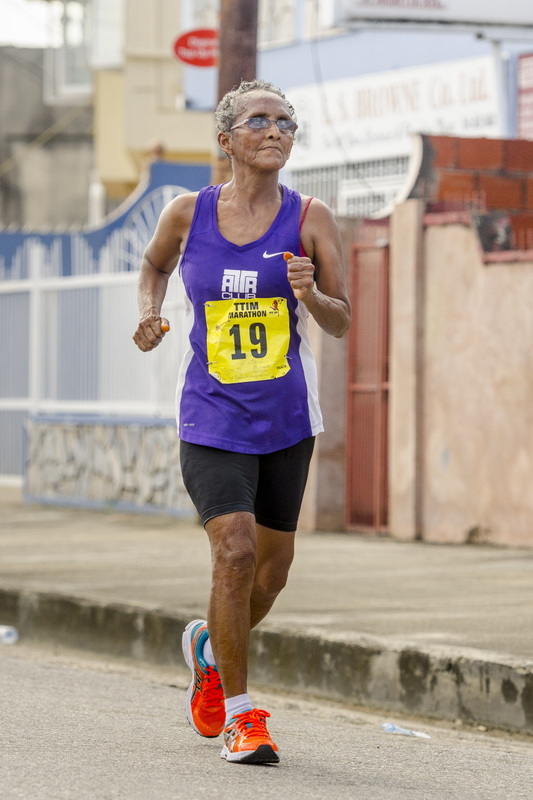 Ordinarily an active and dedicated marathoner, Lynette 'Granny' Luces, at the age of eighty-seven sits out today's event. January 25th, 2015. A quick mishap with the inflatable finish gantry leaves volunteers temporarily manually holding the gate open for finishing athletes. 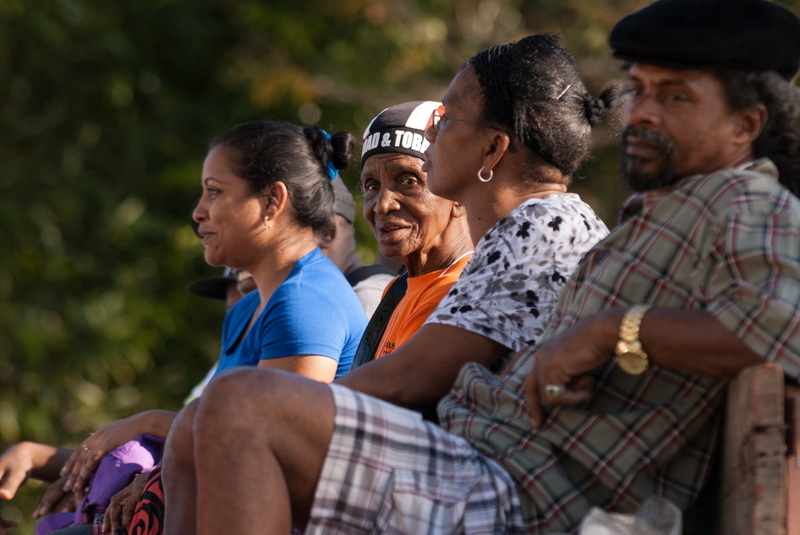 Scene from the 2015 Trinidad and Tobago International Marathon, which was run from Saint Mary's Junction, Freeport to the Queen's Park Savannah. January 25th, 2015. 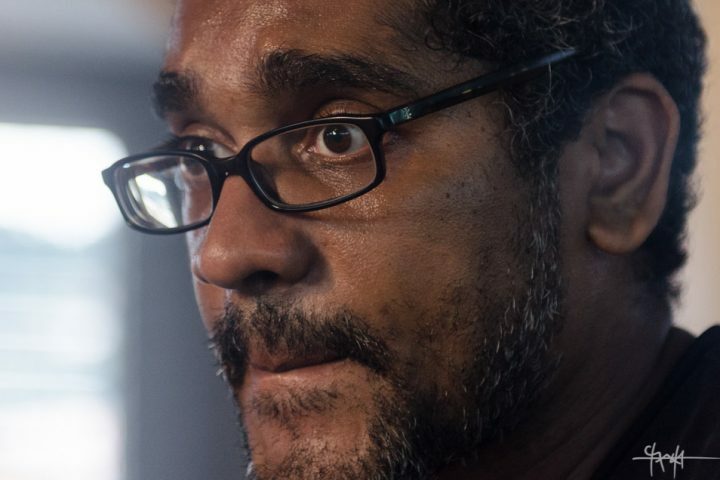 With an intense countenance, TT photographer, Kibwe Brathwaite seeks out scenes to capture at the 2015 Trinidad and Tobago International Marathon. January 25th, 2015. 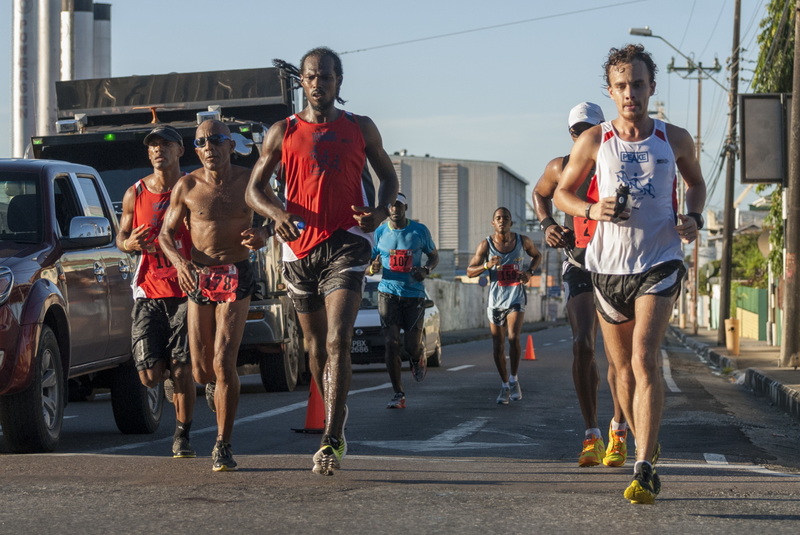 Surrounded by a varied group of supporting onlookers, US marathoner, Kevin Brosi, closes off the 2015 Trinidad and Tobago International Marathon. January 25th, 2015. 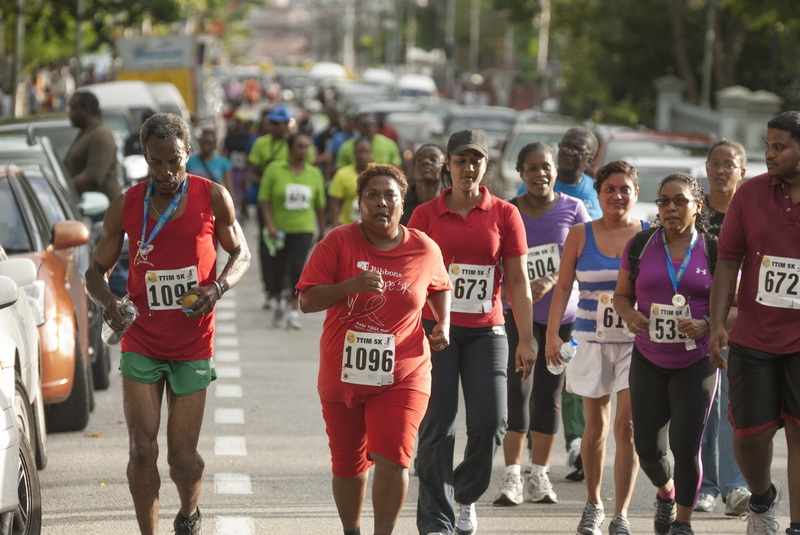 A large pack of participants at the 2014 TT International 5K, held on 25th January, 2014. 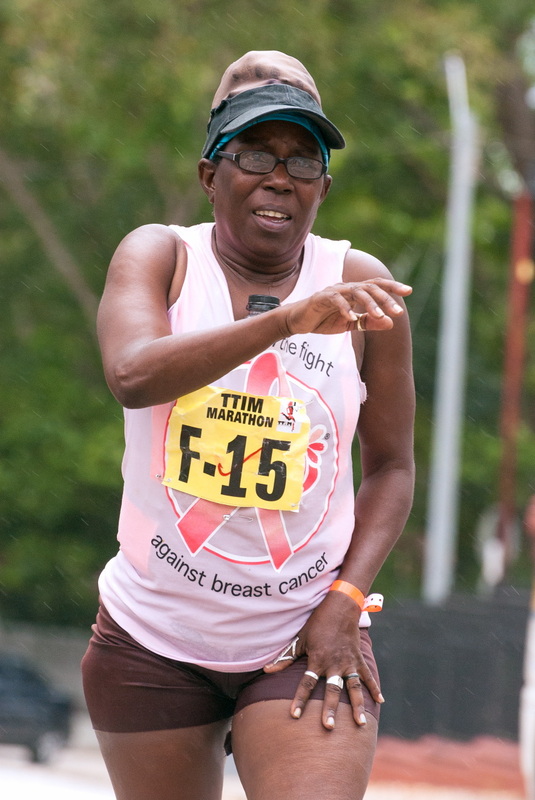 A mature marathon participant staggers her way defiantly to the finishline. 26th January, 2014. 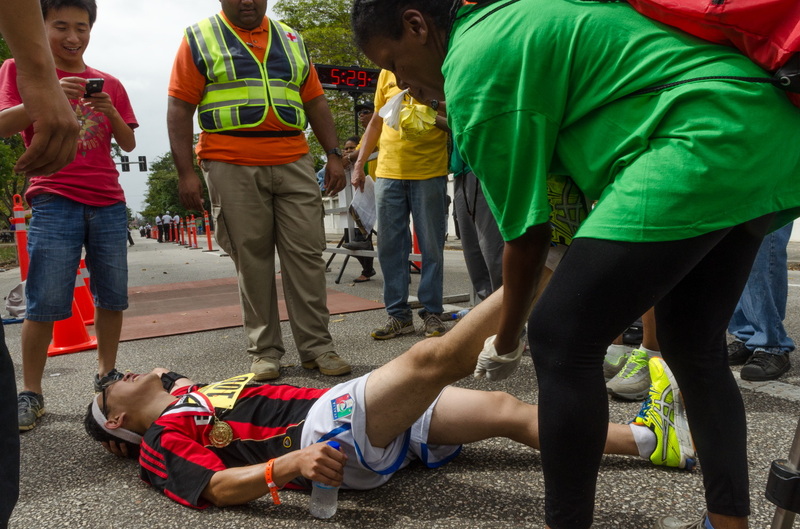 An international marathon participant collapses to the ground immediately upon crossing the Queen's Park Savannah finishline, while an associate photographs via smartphone. 26th January, 2014. 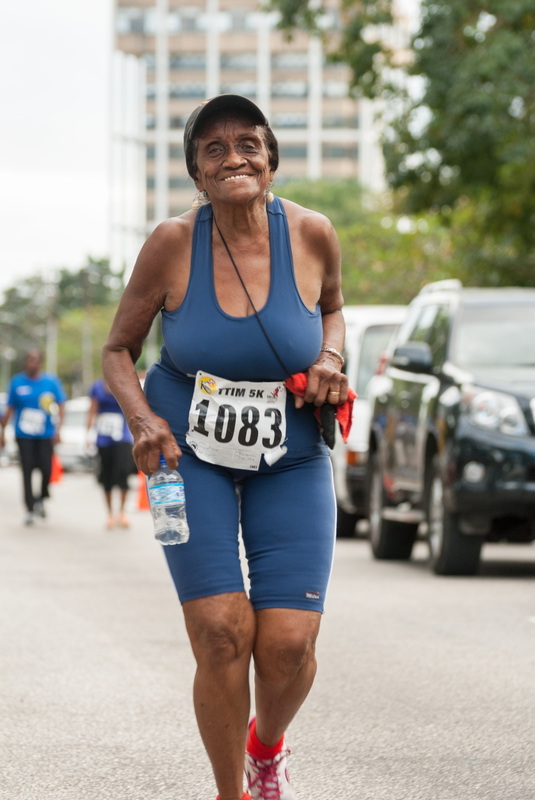 Lynette 'Granny' Luces at age eighty-six runs the TT International 5K. 25th January, 2014. 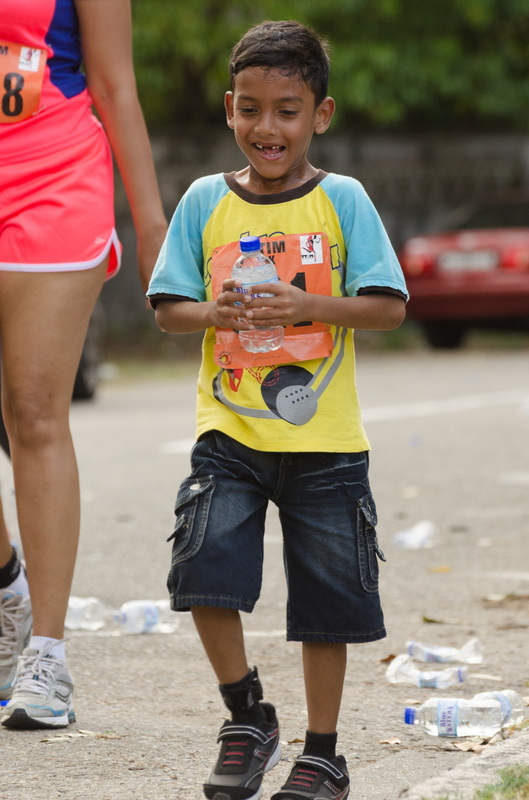 A young participant in the TT International 5K. 25th January, 2014. A message to race participants on the morning of the TT International 5K. 19th January, 2013. 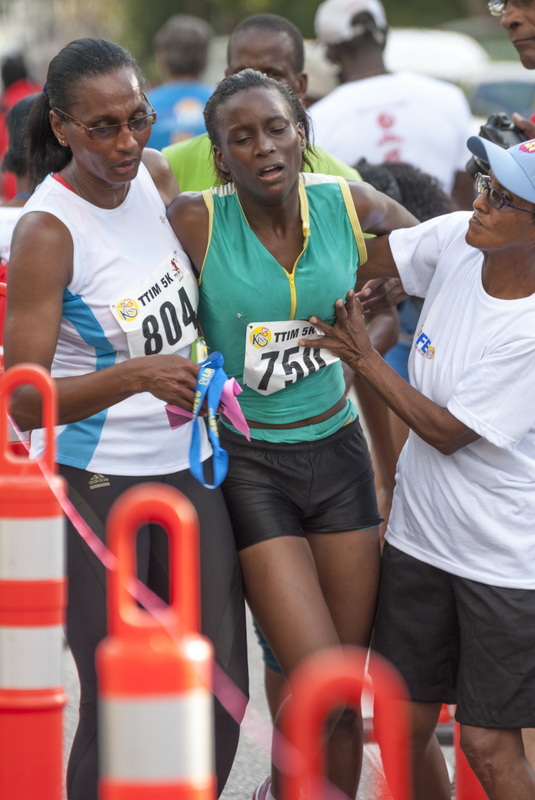 Zaria Harvey, second place, under-fifteen runner, is helped by volunteers after crossing the 5K finishline. 19th January, 2013. A pack of 5K participants making their way to the finish on 19th January, 2013. 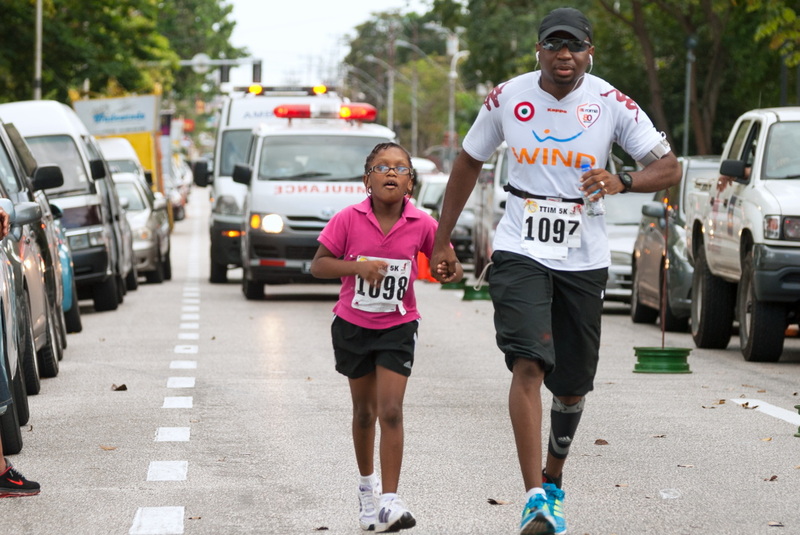 Jeremy Francis finishes the TT International 5K hand-in-hand with his daughter as she self-motivates by repeating encouraging words to herself. 19th January, 2013. 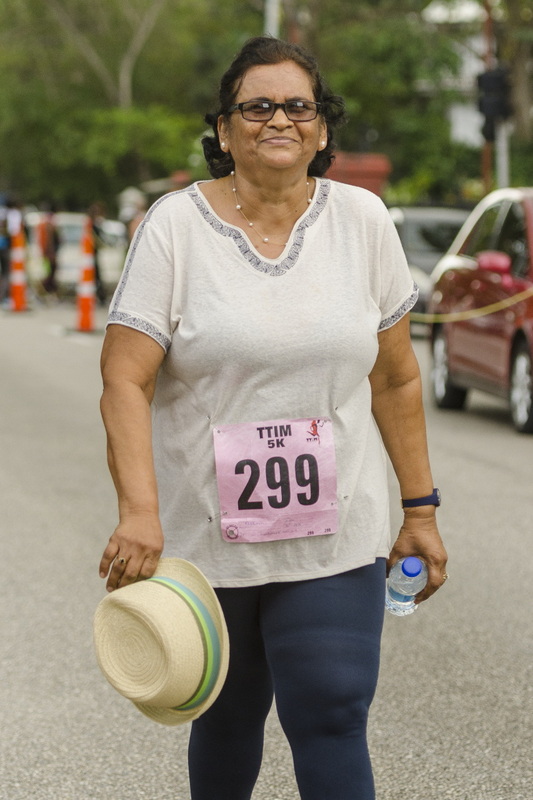 Joyce Henderson, over-seventy 5K participant, smiles as she goes along the course. 19th January, 2013. 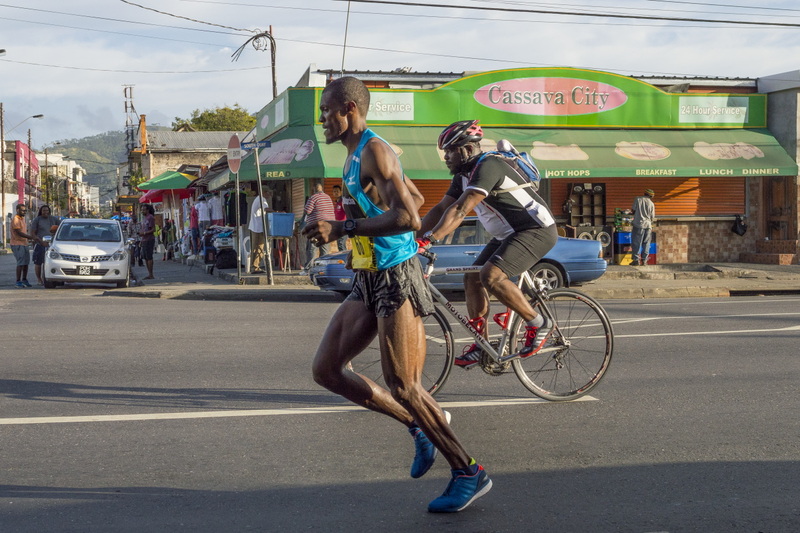 Jonah Camps and other TT International Marathon runners near the Tragarite Road intersection, making their way toward the Queen's Park Savannah. 20th January, 2013. 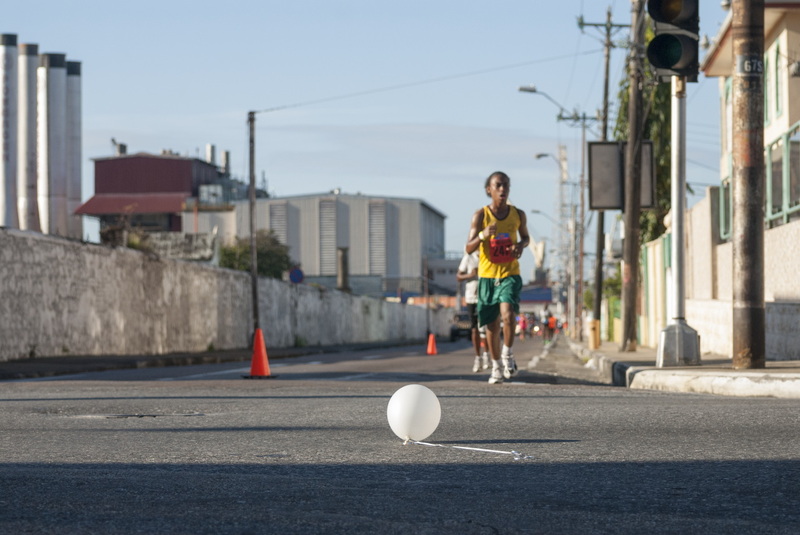 A white balloon of unknown origin crosses Tragarite Road while TT International Marathon runners approach from Ariapita Avenue. 20th January, 2013. 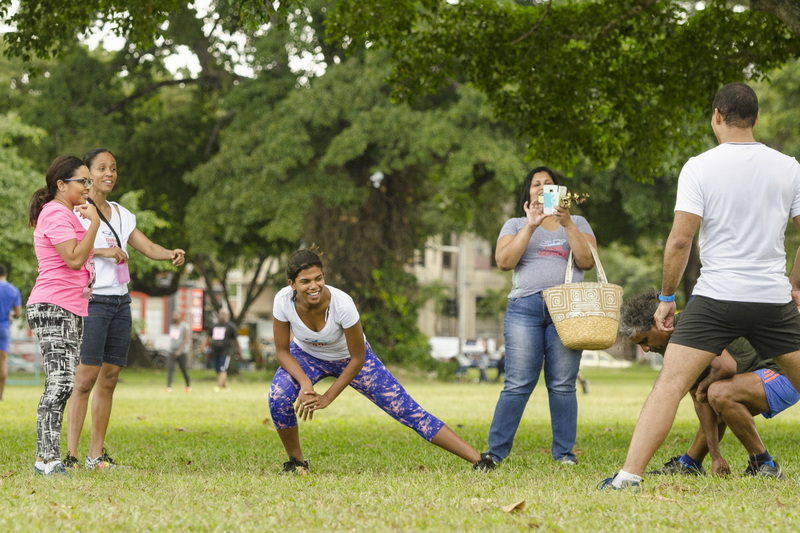 In a political shirt, a passerby pauses to dance and sing a politically-charged song to the camera. 20th January, 2013. 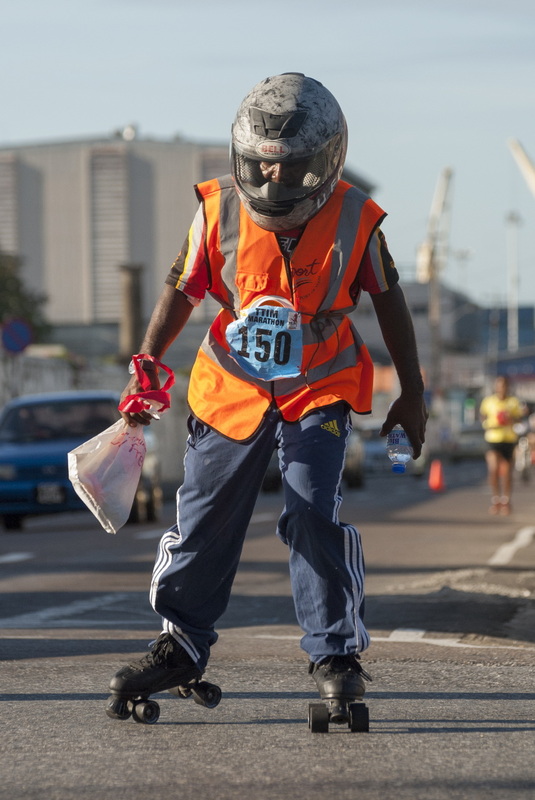 A marathon runner in chafe-avoidant clothing runs along Colville Street, Port of Spain. 20th January , 2013. 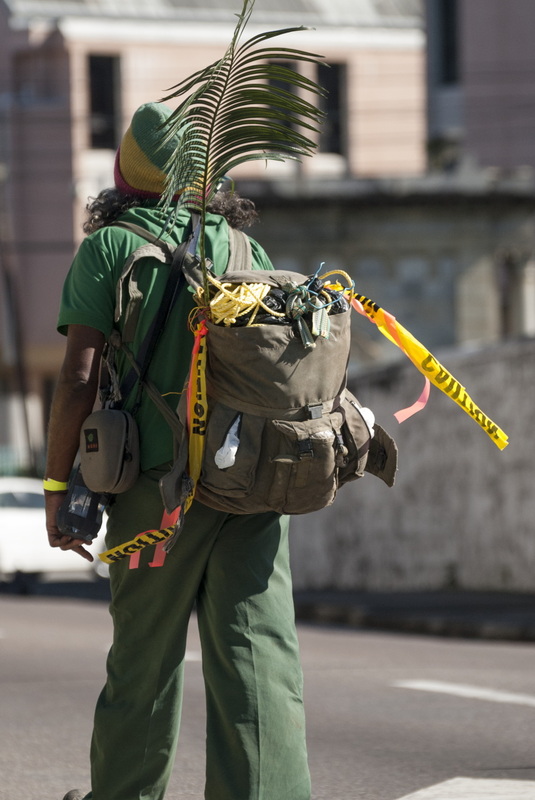 Dan Jaggernauth makes his way along the TT International Marathon's 42km course with a backpack of varied equipment. 20th January, 2013. 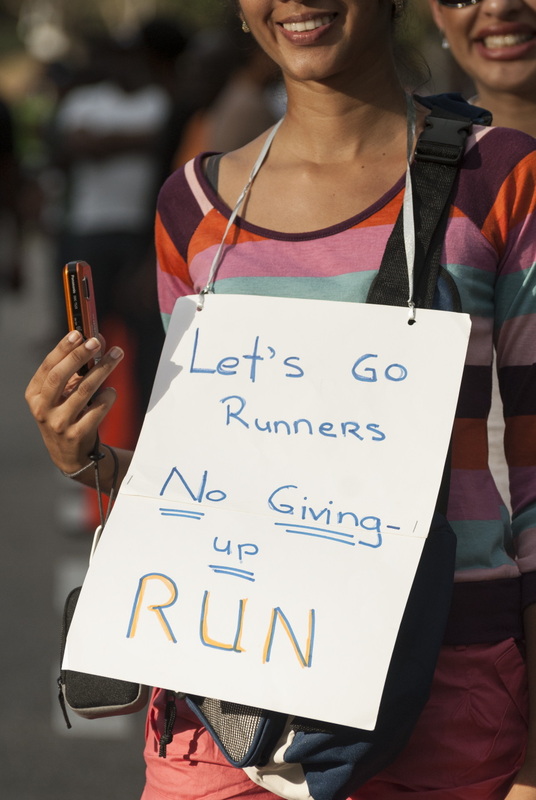 Thirty-five years to the date of this writing, the Trinidad and Tobago International Marathon has been taking place. Beginning in 1983, it originally was known as the Mirror Marathon, titled for its main sponsor. Over the years, the event changed hands a few times, but always maintained. It became well-known during the era of CLICO’s title sponsorship until the eventual CL Financial fiasco of 2009/2010. 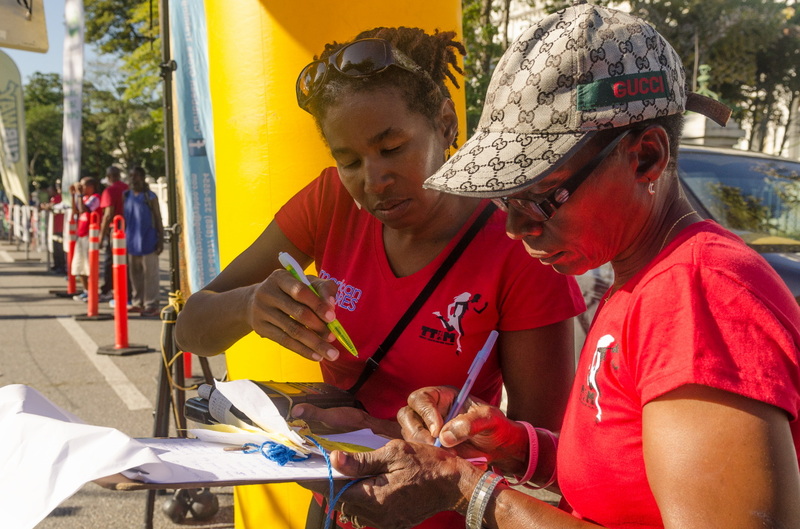 Today the Trinidad and Tobago Marathon Committee, headed by Diane Henderson, continues working on the event’s success and popularity. 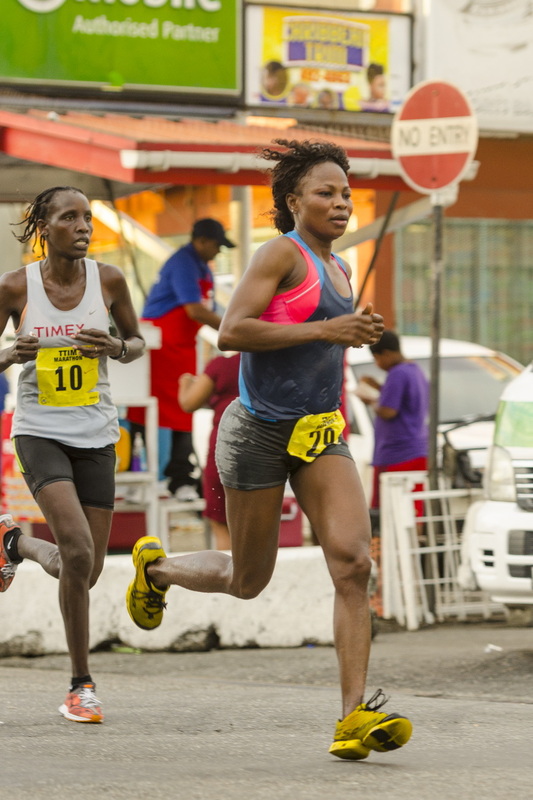 The 2018 edition expects to see approximately 400 participants and 100 relay teams cover its 42km~ distance from Saint Mary’s Junction, Freeport, to the Queen’s Park Savannah, Port of Spain. 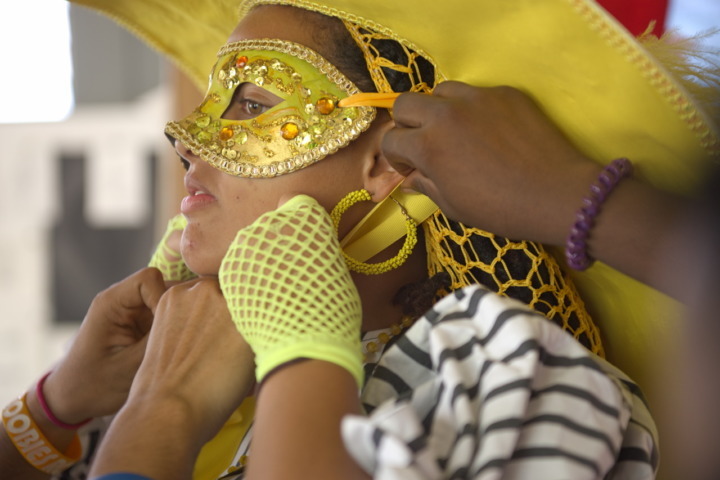 Granderson Lab, Belmont: Tracey Sankar of Crick Crack Traditional Mas works on her pair of presentations for the 2018 Carnival Monday. Artists, Luis Vasquez La Roche, Alicia Milne and Nikolai Noel participate in a drawing performance, in which each attempts to image the others two hundred times. August 30th, 2014.